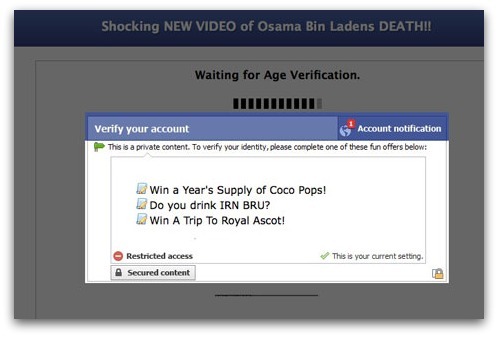 A new scam is spreading on Facebook, its “Osama Bin Laden death video”. Beware of this scam, as there is no such video. 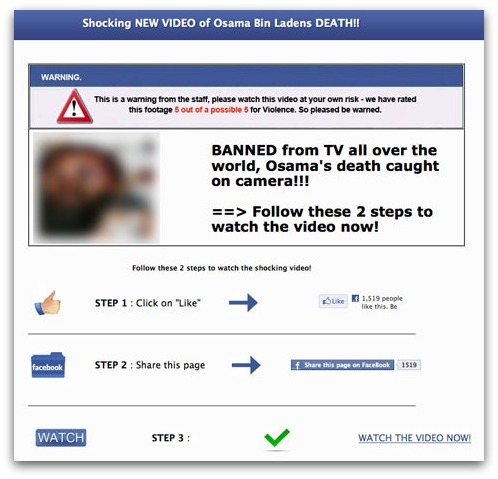 The link on facebook claiming to be banned video of the death of Osama Bin Laden spread virally across Facebook just after the news of Osama Bin Laden. According to nakedsecurity, you will be asked to click the Like button and share the link with your friends before you can watch the video. Do not click any such link, its completely scam. Do not pay anything for such video, or give your login details. Also, do not complete any survey if asked.